Having spring break FOMO? Wasting away under the florescent lights of adulthood? 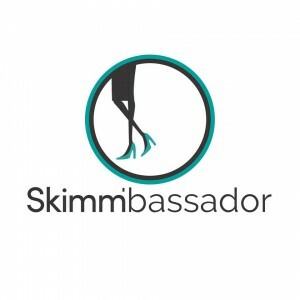 Want a break from the monotony of your 9-5? Sounds like you need a staycation. It’s like college spring break, but better because you are employed and actually have money now. 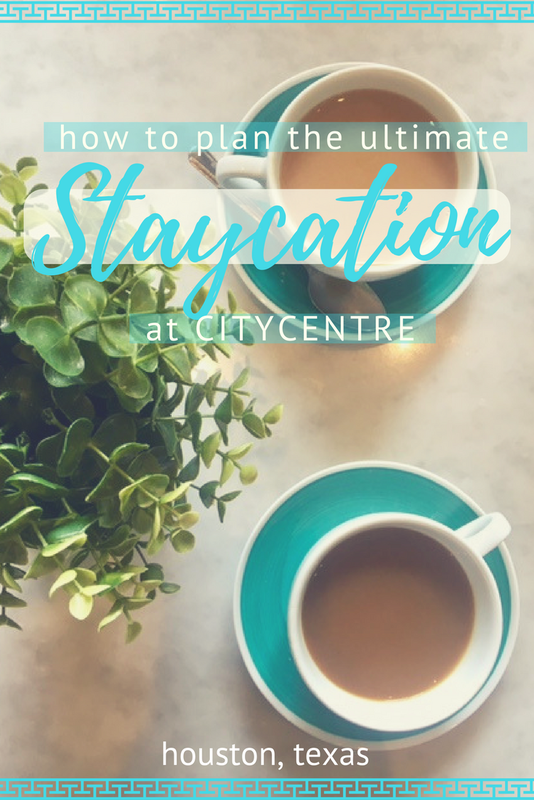 Here’s how to spend get some serious R&R and have the ultimate staycation at CITYCENTRE! In case you haven’t been, CITYCENTRE is this adorable outdoor multi-purpose complex in Memorial in Houston. 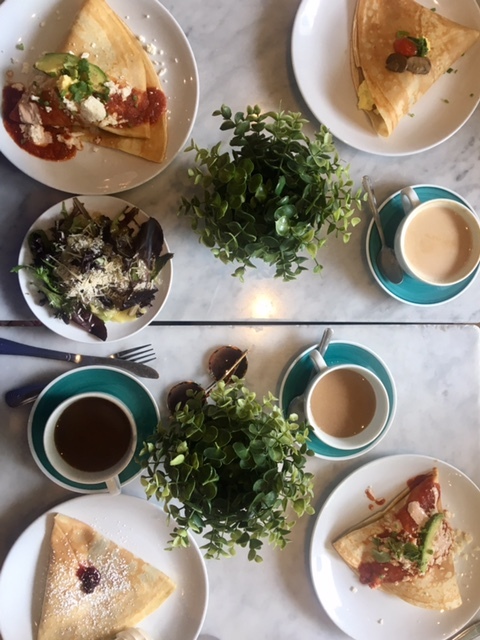 Last weekend, I planned a staycation and had a blast and half with my girlfriends. Here’s what we did! 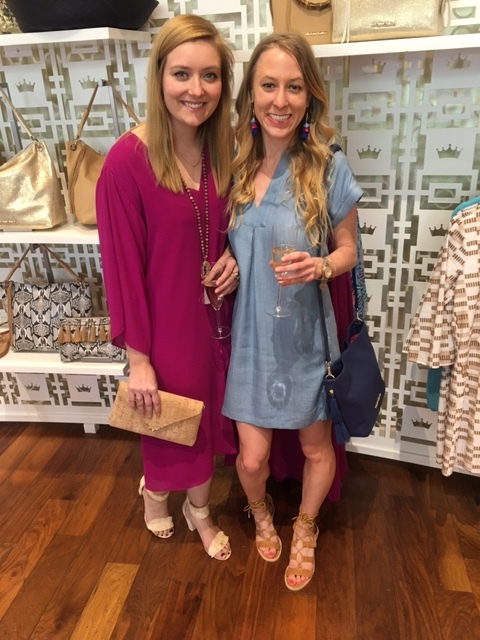 This post is sponsored in part by Hotel Sorella, Radio Milano, Kendra Scott, Elaine Turner, and Bowl & Barrel. As always, all opinions are my own! For a proper staycation where you want to get away, but not too far away, Hotel Sorella is the perfect fit! It’s glamorous and boutiquey with a modern vibe in the lobby and rooms. 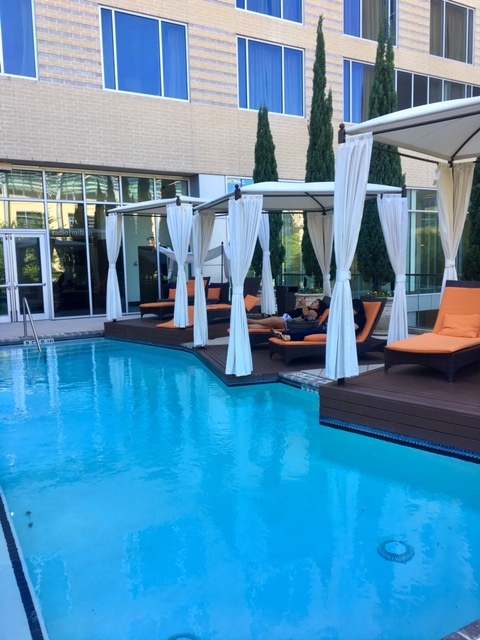 To grab some sun, the Hotel Sorella pool is perfect to visit during the morning or early afternoon before the sun hides behinds the buildings. 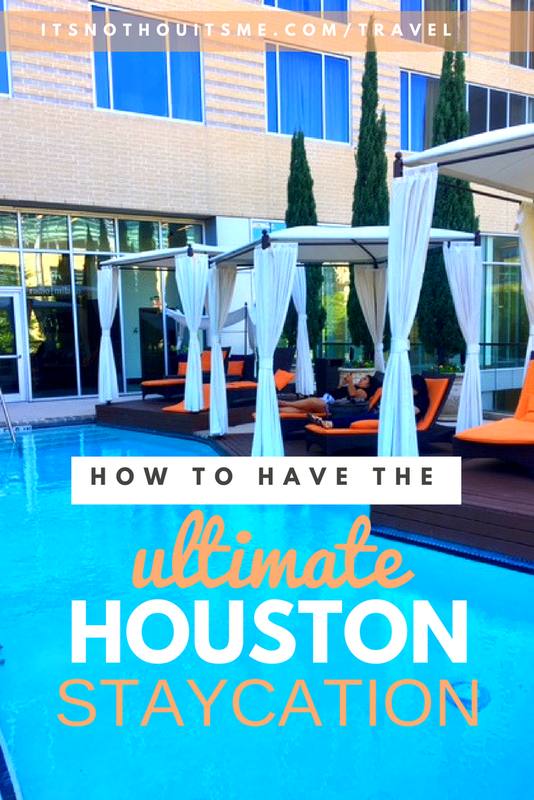 Although the pool is small, the cabanas and bright orange lounge chairs are adorable. Over the year’s CITYCENTRE has really blossomed and become quite a hub for all sorts of stores and boutiques. 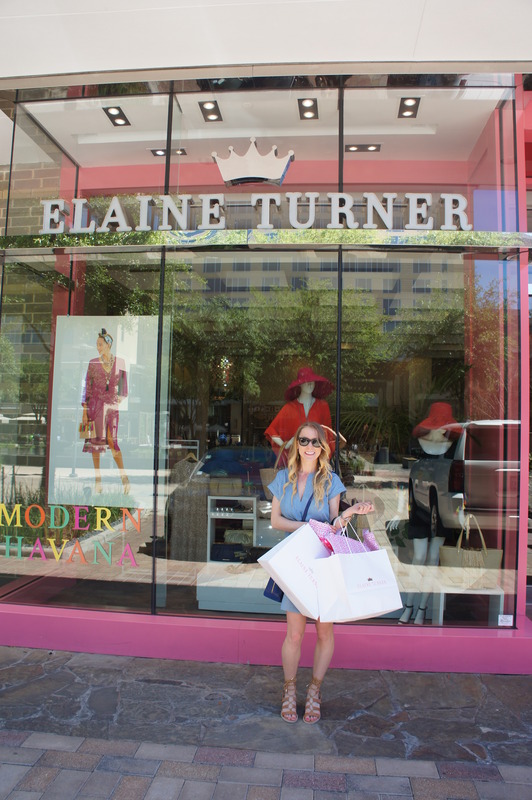 As a fervent lover of all things Houston, no visit to CITYCENTRE is complete without a stop in Elaine Turner. Her current Modern Havana designs are bright, modern and perfect staycation attire! 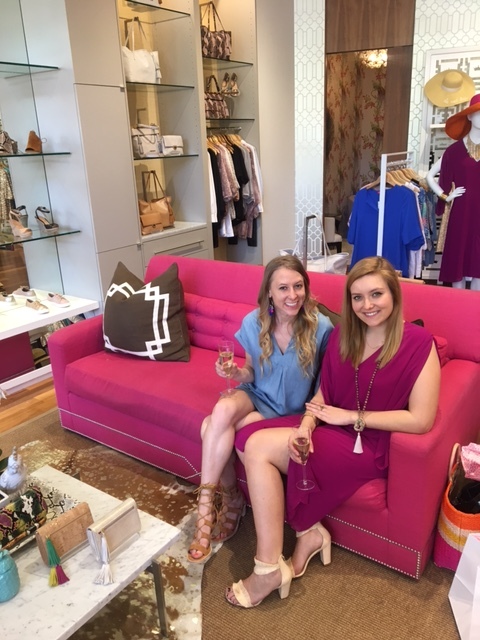 The staff in the store spoiled us when we shopped in with champagne and we may or may not have had too much fun trying things on. The dressing room is gorgeous. And I have a major crush on the fuchsia couch. #DesignGoals. 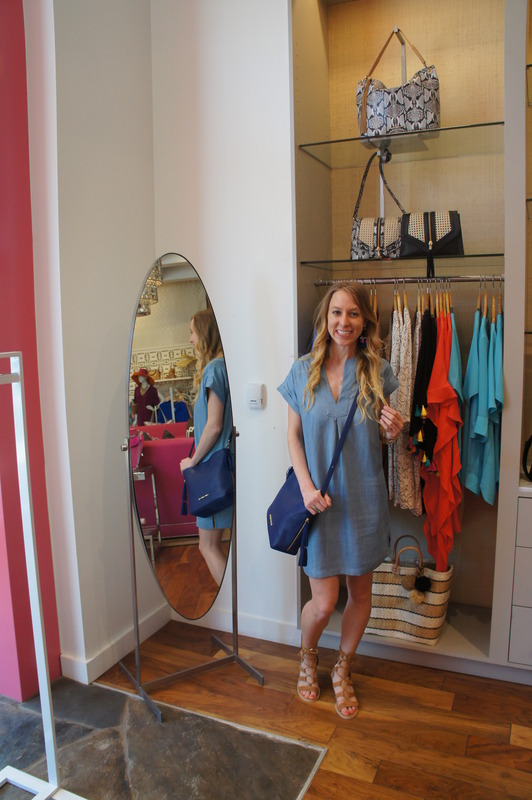 After trying on everything from hats to earrings, I managed to narrow it my outfit down to a beautiful chambray” Samara” frock, cobalt Liann crossbody purse, and the Zia heels in suede. Once I figured out how to tie the shoes (the laces are miles long! ), I’ve been pretty much living in them non-stop. They’re made with this amazing memory foam cushion with the perfect amount of heel, so it’s like walking on air. 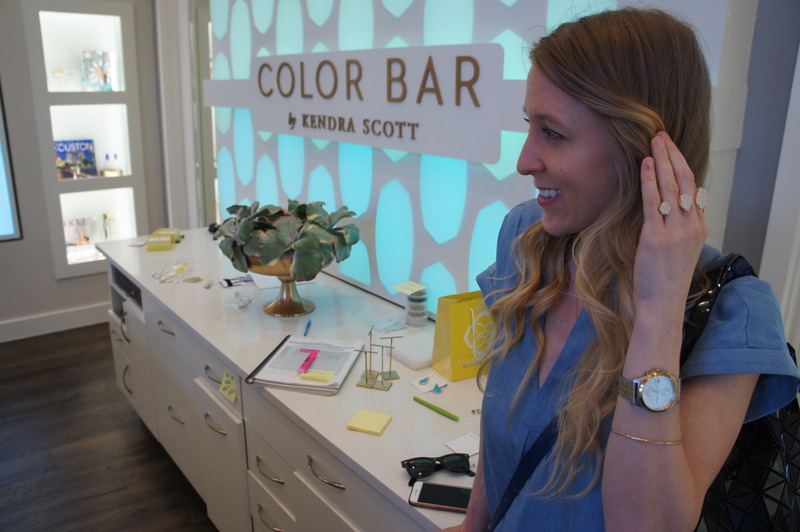 To complete my outfit, I headed over to Kendra Scott–another beloved Texas designer. Despite being wildly familiar with her designs, I was ultimately inspired by hearing her story on the podcast How I Built This to finally make a visit. On a Friday afternoon, the store was packed. The jewelers were quite helpful as I maneuvered my way through the displays, trying things on and picking out my favorite pieces. As a fan of classic, versatile pieces I ultimately went with gold Sophia drop earrings and Naomi Two Ring in Iridescent Druzy off the shelf. 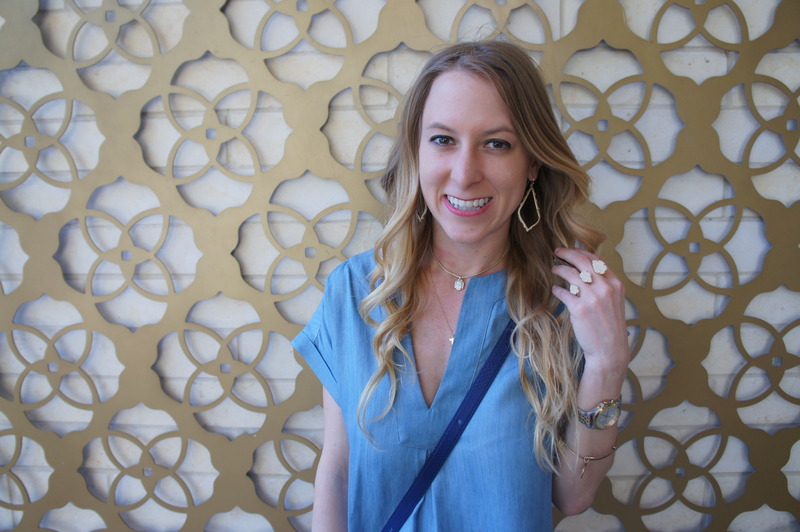 For the full Kendra Scott experience, I designed my own Teo necklace (from the new Spring collection!) from the color bar. 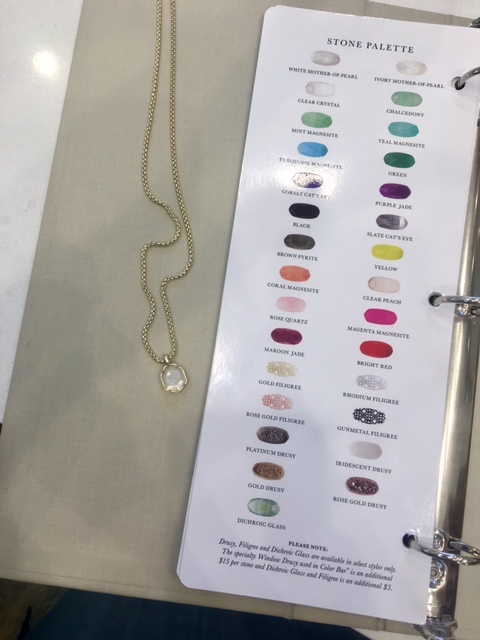 I picked out the chain color and then had the opportunity to choose my stone from a pile and watch it get pressed into the necklace for me! The individuality in the piece and the experience is pretty fun! 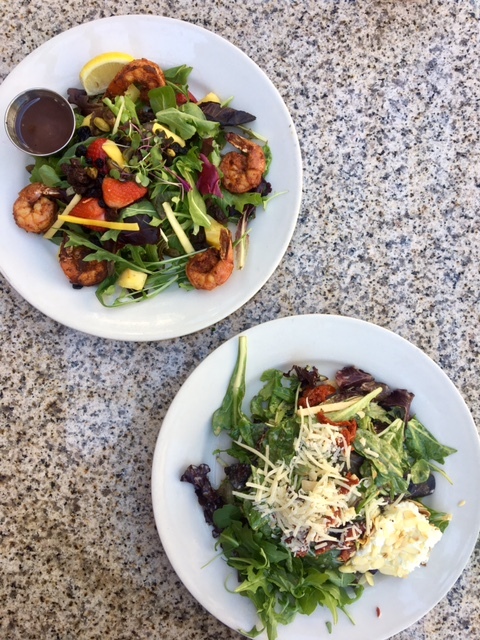 CITYCENTRE offers so many fantastic dining options, there’s something for everyone! 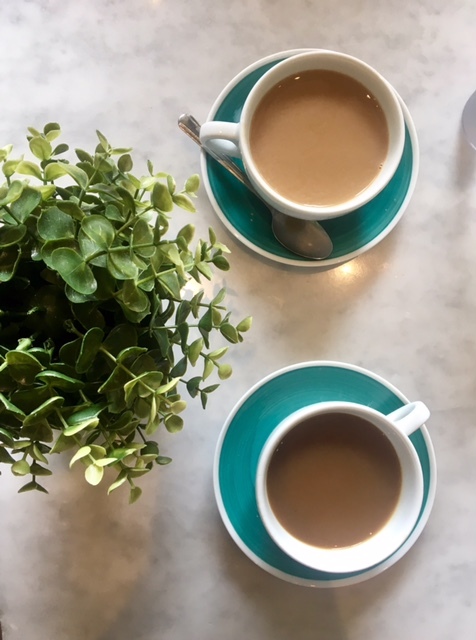 A great lunch spot is Ruggles Green. It’s healthy, offers lots of vegetarian options, and has great outdoor seating. I also really love the Tasting Room. My go-to order is the Roasted Veggie Pizza and a bottle of champagne. Happy hour in CITYCENTRE is perfect sitting outside on the patio! 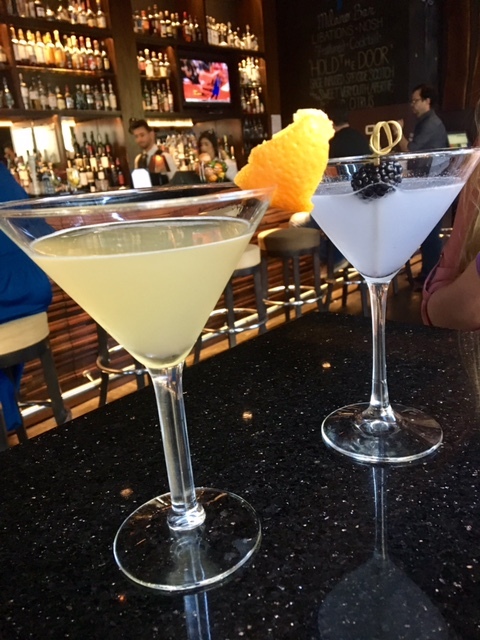 On Friday night, we tried something new and grabbed drinks at the upscale Radio Milano bar in Hotel Sorella. The drink menu, which came on an iPad, had a fantastic selection of cocktails and wine. We tried just about everything on their cocktail list including the Earhart (smooth tequila! ), the A Farwell to Oaxaca (smoother tequila! ), the Lost Cause (complete with a cinnamon stick! ), and Hold the Door (house favorite). My personal favorite was the super fruity Lucid Dream, and least favorite was the Dante (smelled like a wet dog). 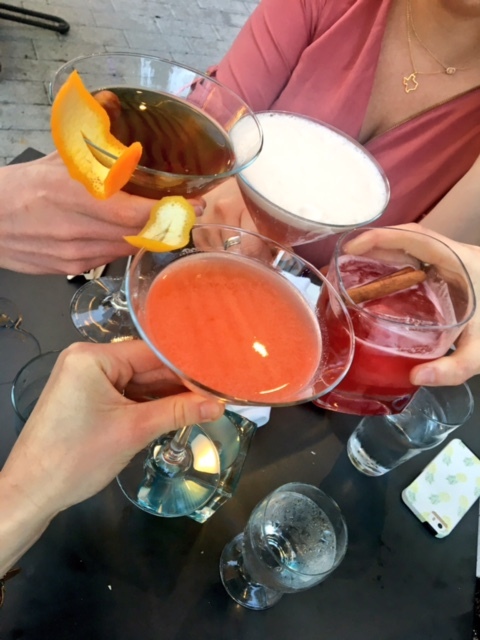 We drank al fresco and washed down our drinks with some to-die-for truffle fries. Afterwards we headed upstairs for dinner at the Radio Milano restaurant. The dinner menu boasted some fabulous homemade pasta entrees like squid gnocchi, beet tagliatelle, and cauliflower ravioli. The staff in both locations were incredibly accommodating, walked us through the menu in detail, and offered wine pairings too! 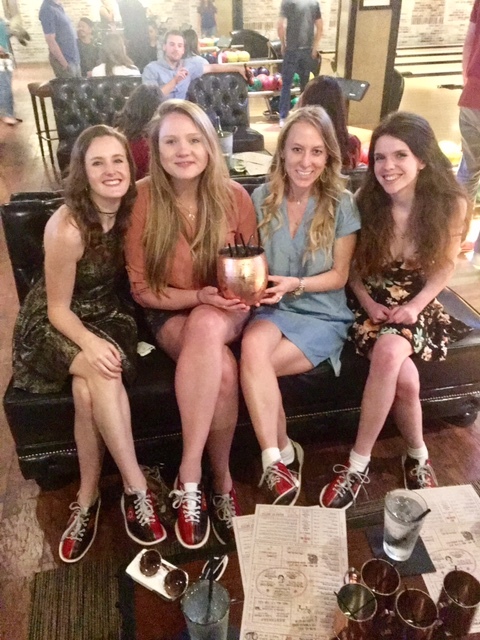 Friday night, we had a blast at Bowl & Barrel, a grown up bowling alley with a fantastic bar and cocktail menu. The four of us split a massive whiskey-based Moscow mule. It reminded me of the giant group pitchers at Howl at the Moon–but much classier and heavier (I swear it weighted more than the bowling balls!). 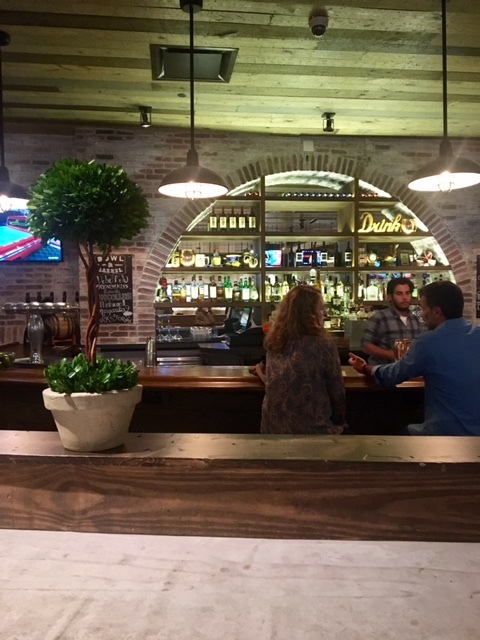 Having a reservation is key to getting a lane at Bowl & Barrel on a Friday night–that place was popping! Despite showing up nearly an hour late to our reservation (oops, dinner was just too good! ), we managed to grab a lane and played two full games! Afterwards we walked on over to Straits which turns into a bumping club with DJ and small dancefloor after 10pm. Next door was Yard House which was also open and full of people late into the night! At the night’s end, we waltzed on over to the Hotel Sorella and fell asleep on some of the most comfortable hotel pillows I’ve ever laid my head on (and I travel a lot). 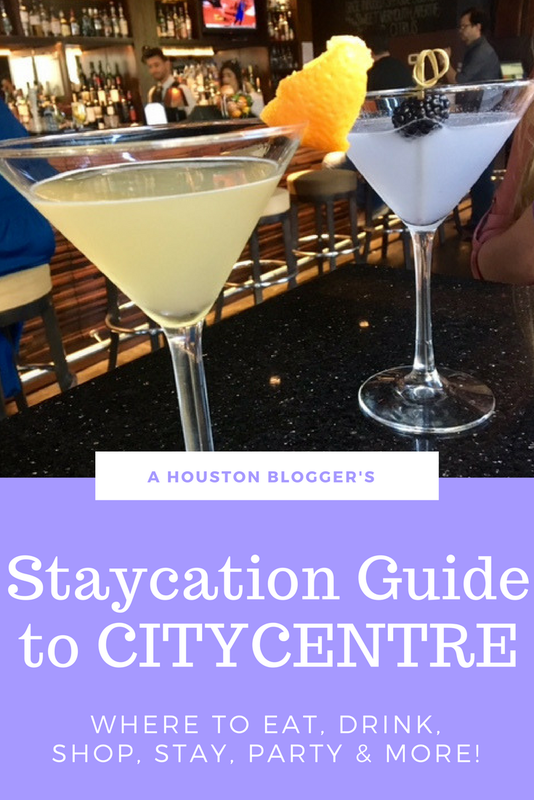 CITYCENTRE is also a great place to have a staycation because on weekends there’s always fun events in the plaza and at the stores. While we were there, they had a dog party in the plaza with tons of vendors and booths. Check out their event calendar here! 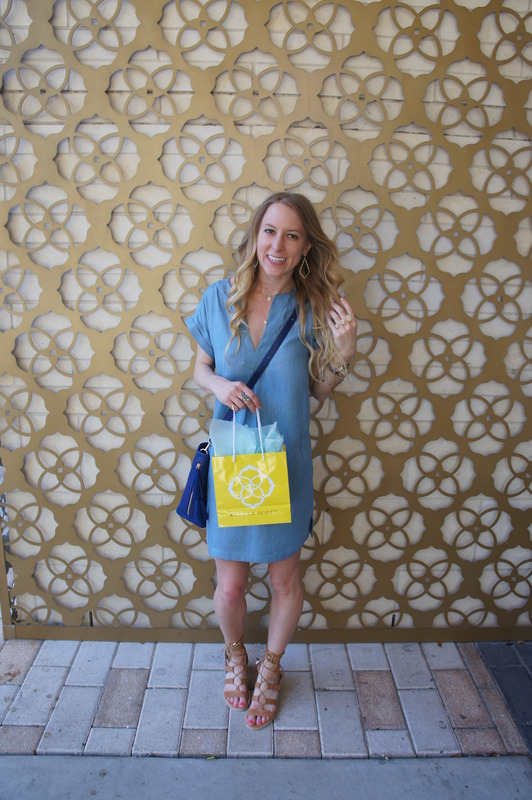 Tags: Bowl & Barrel, CityCentre, Elaine Turner, Hotel Sorella, Houston Staycation, Kendra Scott, Mother's Day, Radio Milano, Ruggles Green, Staycation, straits, The Tasting Room. Bookmark the permalink. Looks like the folks at City Center were treating y’all really well. I’d like to try the Lucid Dream with some truffle fries on the side after a lazy day at that gorgeous pool.. You go girls!